But I digress. After Mary pulled my pint, I met Joe Kelly, her husband, and their son Stephen. Joe and I have traveled in similar parts, and Stephen is a hiker. Soon the maps came out, the dog showed up, and we were engrossed in conversation. You might say I stayed beyond closing time, but the pub had never officially opened. 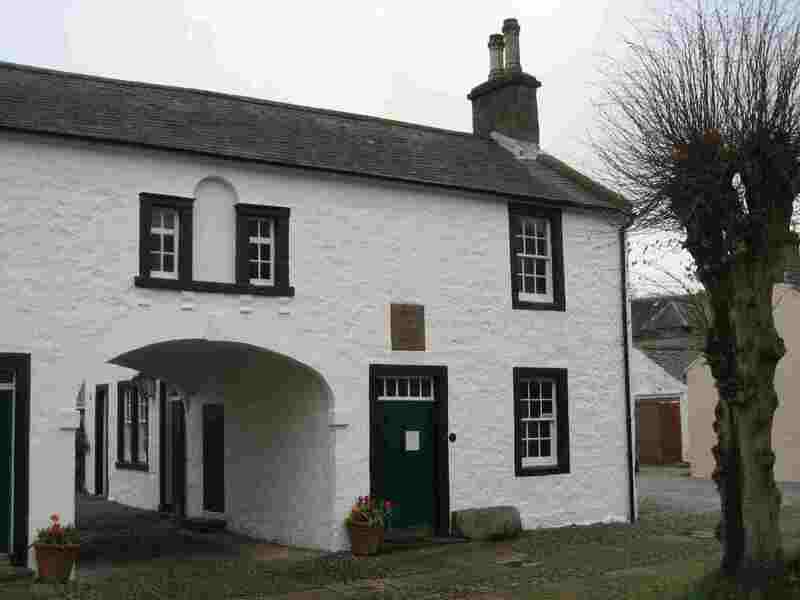 Ecclefechan (the "ch" is pronounced the Scots way, as "ck") was Thomas Carlyle's birthplace in 1795, and I had strayed a short distance off the road to visit his modest home. From here, at the age of 13, this future philosopher and historian had actually walked the 85 miles to attend Edinburgh University. The Carlyle museum was closed but the Ecclefechan Hotel was open as I've described. It's a very old place that Joe and Mary plan to expand and renovate once their plans get approved, given that it's a Grade 2 listed property and they have to preserve its historical features. I'll try to revisit one day; it's only a mile off the freeway. Incidentally, they make Fechan Whisky close by here in Scotland. Joe also showed me an Irish whiskey called Fechin. Again, the "ch" is pronounced "ck". I'll say more about this later. Eventually I found a nice B&B where Shona Black even mentioned a soak in the bath, proving that her place is the one for a hiker to stay when in Lockerbie. Lockerbie is the town where the PanAm 747 crashed after a bomb explosion, killing many townspeople and all passengers and crew. Shona was a florist at the time, and arranged the flowers at the memorial service. For dinner, I found an Indian restaurant on Bridge Street, a steep road that faces Mounthoolie. It advertised “Tuesday buffet dinner, 6 pm to 8.30 pm”. I was in the zone, so to speak, and though the place looked questionable, I went in. There was no buffet that I could recognize as such in the restaurant. But, through deplorable English, the management somehow indicated that the food would be unlimited – so I sat down to it. What they didn’t tell me was that they selected the food – a kind of reverse buffet. In time, a plate of appetizers arrived, of the sort I try to avoid in an Indian restaurant, followed by a plate of something else, which I also try to avoid in an Indian restaurant. When I left the reverse buffet, I had mixed feelings. Mixed feelings? I felt hungry and sick at the same time! I decided that I got what I deserved. In a small remote town, when the B&B recommends that you eat in the King’s Arms, you should eat in the King’s Arms. Now you would never have guessed, but I ran into fictional Arthur Bourke-Stewart again this evening, right in the King's Arms where I had an after-dinner beer. "Call me BS," he said, "like my other friends do." He bought me a beer at once. Me: What brings you here, BS? BS: Why, I've been delivering some of that high-speed socks supplement that you devised, Daryl. Me: You mean the sardines which hikers put in their socks, which makes them walk faster 'cause they can't stand it? BS: Yes, indeed, I've sold nearly 100,000 of those, Daryl, thanks to you! BS: Well, let's put it this way. We get complaints all right, and we don't get a whole lot of repeat business. But they're still selling. Me: How do you sell them? BS: We advertise in the Hiking Herald and other places. The magazine threatened to stop our advertising, but we persuaded them to keep us because of our 100% no-quibbles money back guarantee. Me: Do you have a lot of people take you up on that, BS? BS: You must be kidding! Not a one. That's because we sell the product for £1 plus £4 shipping and handling, which actually only costs us £2. Our guarantee only applies to the £1, and they can't be bothered to return it. You see, they'd have to pay £2 in shipping to get £1 back. Me: I see you've become quite the tycoon I thought that you'd be, BS! But what if the Hiking Herald ends up telling you they won't take your ads? BS: Not a problem! We're selling in Skating Times, and Junior Athlete, too. And to the scouts. And I think I might soon land a contract with the Ruritanian Army for their foot soldiers! Me: Great going, old chap. Me: Well, BS, as a matter of fact, I do. To the same high standard as the other ones, as well! BS: Wow! Tell me more. Me: For this one, BS, you need to acquire the rights to wholesale Fechan Scotch and Fechin Irish whiskies to the pubs. BS: OK - and then? Me: Then you need to supply these whiskies to pubs with a large clientele of Irish laborers. BS: I see. But how do I locate these Paddy pubs? By the vomit outside on Sunday morning? Me: Now, now, BS; we wouldn't want to insult the Irish. Most British pubs have vomit outside on Sunday morning. And all the rest have vomit both outside and inside. No my friend, you have to find the pubs with Irish laborers more subtly. Just go around until you find a pub that's so full of cigarette smoke that you can't see. Then listen - and if you can't hear anything sensible being spoken . . . that's most likely an Irish laborers' pub. BS: OK, I gottit. But how does that help me sell the Fechan? Or Fechin? Me: That's a very good question, BS. Do you suppose we're ready for another beer? BS (returning from the bar with another couple of beers): And the answer is? Me: It's simple, old chap. You just go in to the pub, and say, "There's a Scotsman over there who says that you Irish can't hold your whisky!" BS: Uh huh. And then what? Me: Darn it, BS, you're good at running the businesses I set you up in - but it takes a while for you to grasp the brilliant concept in the first place! BS: So, I tell the Irish laborers that a Scotsman says they can't hold their whisky. And . . .? Me: Then they all shout out in unison: "Barman, bring me another f---ing whisky!" BS: Yes, but . . .
Me: Dammit, BS, when they call for a f---ing whisky, you just make sure that the barman understands that they're calling for Fechan by name!